The Sweet Bookshelf: A BIG Giveaway! Thanks to the lovely people over at The Hachette Group, I've got 5 copies of The Blue Star by Tony Earley to giveaway! LUCKY US!! How do you enter? I'm so glad you asked! That's it! Just do those 2 little things and you'll be entered...but you MUST do both! The contest ends Aug 20th! Go tell your friends! US & CA ONLY--Sorry my International friends! 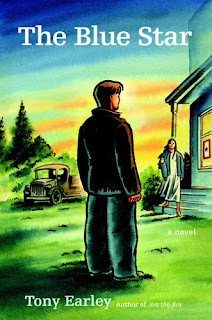 Tony Earley's first novel was Jim the Boy and The Blue Star is its sequel. Time has moved forward to the eve of World War II, but everything else is much the same in the countryside of North Carolina. Jim Glass is now a senior in high school, living in the peaceful haven of his three uncles and his mother. Love complicates his otherwise halcyon life, in the person of one Chrissie Steppe. We can't help whom we love, and Jim has made a big mistake by falling for Chrissie. She and her mother are in what amounts to indentured servitude up on the mountain, living on the property of the influential Bucklaws. Their son, Bucky, is in the Navy and expects that Chrissie will wait for him. She has nothing to say about it because she and her mother have nowhere to go if they are turned off Bucklaw's land because Chrissie has other ideas. Please enter my name for The Blue Star. The book looks so interesting. Thanks. Mary, you are so amazing! I love ya! my email is [email protected] Have a fabulous day!! I just found your site and would love to win this book, please count me in. i am now following! this is awesome! I would love to have this book, please count me in! Hey Mary- I totally meet both requirements!! You're amazing! I love the new blog. I'm following. Count me in. Enter me please! I followed your blog.